Nonograms: Wolf's Stories offers hours of satisfying puzzle-solving fun! 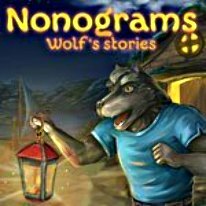 Nonograms: Wolf's Stories is a captivating logic game with simple rules and challenging solutions. Each level is made up of a grid of squares that must be either filled in or locked. Your goal is to find the squares that must be filled in. Wrapped in a heartwarming story of a father wolf searching for his cubs, Nonograms: Wolf's Stories offers hours of satisfying puzzle-solving fun!